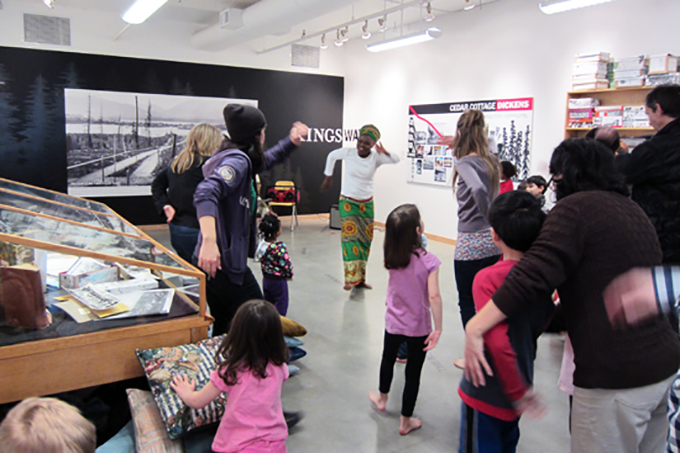 For our February ArtStarts on Saturdays workshop series, we were pleased to present MaObong Oku. This was the second time we have had this amazing Nigerian-born artist visit us for the ArtStarts on Saturdays series and she does not disappoint. She led a very dynamic workshop along with drummer Kocassale Dioubate, who accompanied her as they kept the audience dancing and moving to the rhythms of West African drumming. 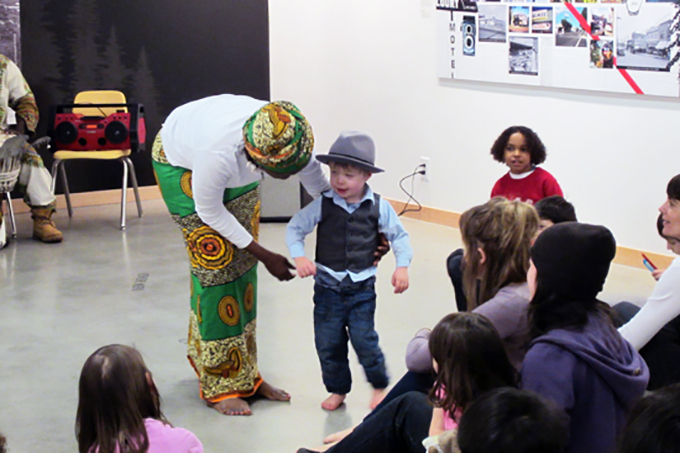 We were invited to experience a true cultural adventure to Nigeria as MaObong taught the audience traditional rhythms and songs. We gained a great understanding of how African people dance to an inner beat that only can be felt through experience. Kids and parents learned different dance variations, voice expressions, tribal chants and clapping rhythms, all of them vital components of African culture. It was very interesting to learn about the specific meanings and symbolism of each dance expression and how it is connected to daily life activities in their culture. Thank you MaObong for sharing your love and wisdom with us! ArtStarts on Saturdays takes place on the last Saturday of every month — check out past workshops here. Stay tuned for our next workshop with One Woman Circus on March 31st. Get involved in the act and share a flare for the fabulous. Renowned for her hilarious, interactive performances, Sand Northrop is a skilled physical comedian, juggler and unicyclist.